These Groovy scripts are being developed as a proof of concept for what will eventually be migrated into steps provided directly in Octopus Deploy. In a previous post, I showed you how to export a certificate managed by Octopus Deploy into a Java keystore, and then configure WildFly to make use of the keystore to provide HTTPS access to web applications and management ports. In this post, I am going to show you how to do the same for Tomcat in Windows. To run the commands and scripts in this blog post, you will need to install some tools. The first is an OpenSSL client. I have used the Windows OpenSSL binaries made available from Shining Light Productions. The second is the Groovy SDK. You can download installers from the Groovy downloads page. 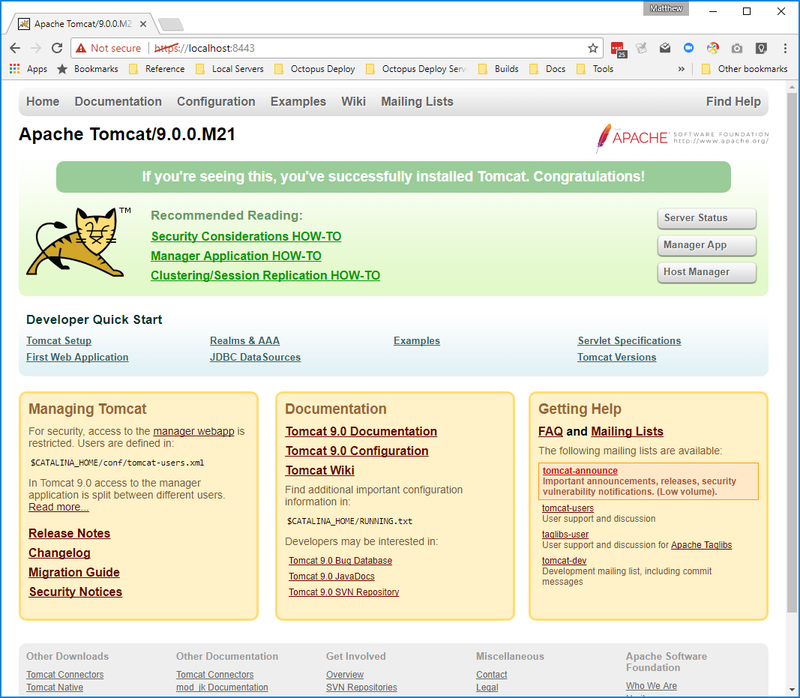 These steps were tested with Tomcat 8 but should work with all versions of Tomcat over 6. Finally, you will also need Java 8 JDK installed. Because both WildFly and Tomcat use Java keystores, the instructions under Creating the Certificate Store and Exporting the Certificate Store in the WildFly blog post can be applied exactly the same way with Tomcat. If you follow those steps, your Tomcat instance will have a file called C:\keystore.jks. To facilitate these changes, we have written a Groovy script that will update the server.xml file with the necessary changes. And that is it! Restart Tomcat and you will be able to access it over a secure connection. If you have any questions about the script, please leave a comment. And if there are some Java features that you would like to see Octopus Deploy support in future, join the discussion on the Java RFC post. Published at DZone with permission of Paul Stovell , DZone MVB. See the original article here.